VVIP jets are the largest corporate jets available to buy – and also the most expensive. VVIP jets use the same airframe as commercial aircraft- but the key difference between a commercial aircraft and a VVIP jet is the interior. There is almost no limit to what owners can install inside their aircraft, so we have complied a list of the best interiors and most unique features fitted to VVIP aircraft. Light, spacious and airy are three words you probably wouldn’t associate when travelling on an aircraft – however this bedroom fitted in a BBJ 737-700IGW will make you think again. Plush carpets and plenty of room makes this a welcoming and comfy way to fly. This spacious VIP lounge on a BBJ 747-8 provides a modern executive space needed for business travel. A high quality finish – including a variety of wood and even some gold – would make this lounge look in place in a high-end hotel, let alone an aircraft. 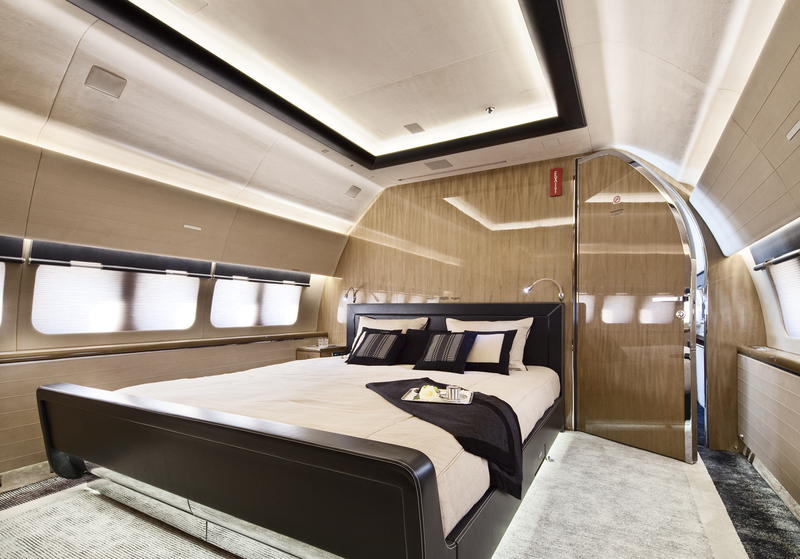 Installed into a BBJ 777-200, this futuristic bedroom comes with a starlight ceiling – a feature synonymous with luxury, with Rolls Royce offering a similar option on their most expensive cars. The level of detail and mood lighting truly makes this interior stand out. This curved walk-in shower has been installed into a VVIP Boeing 787 by Lufthansa Tecknik. The full-sized bathroom is a step up from smaller corporate jets, which usually only boast an additional seat in the bathroom – let alone a full shower. Although fitted into a VVIP jet, this bathroom wouldn’t look out of place in a mansion – strengthening this as one of the best interior features on a jet. One of Greenpoint Technologies’ innovative product lines for the BBJ 747-8 is the Aerolift. The lift – which has space for four people – can carry passengers from the tarmac to the top deck of the aircraft. Having an elevator in an aircraft is most definitely a unique feature, and one which is still uncommon within VVIP aircrafts. The Aerolift is an option for both the 747 and 787 VVIP aircraft, with Greenpoint fitting the Aerolift to four aircraft so far. Boeing have started to offer their Skyview panoramic window for BBJ1, 2, 3 and all BBJ MAX aircraft. The 4.5ft long window allows for unprecedented views and is an innovative new feature for VVIP jets. Boeing also offers the Skyview as a retrofit option – meaning owners of older BBJ aircraft can also enjoy the view.